Nova, this one is for you! 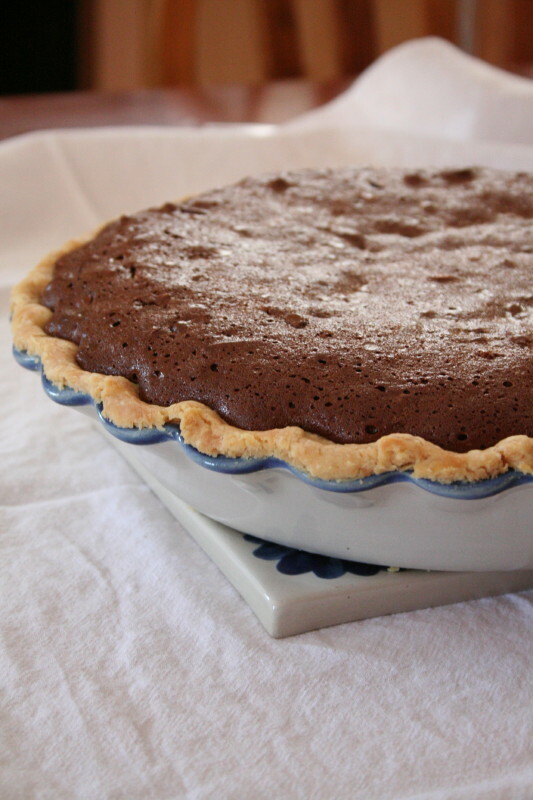 Aaron loves to bake and a few years ago, he adapted his grandmother’s pecan pie recipe to make the most amazing chocolate pecan pie I’ve ever tasted. And I don’t even like pie. It’s that good. Beat eggs until frothy. 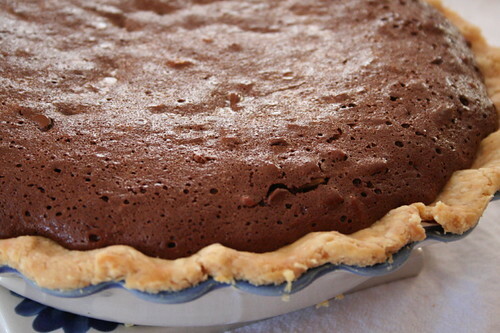 Melt the stick of butter with about 2/3 of the package of chocolate chips and let stand to cool a bit. Mix the chocolate mixture in with the eggs, then mix all other ingredients in as well, saving the pecans and the remaining chocolate chips for last. 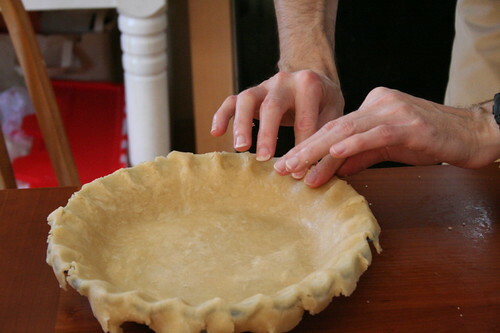 Pour mixture into an unbaked, 9″ pie shell. Cook at 325 for 50 minutes, checking until done. 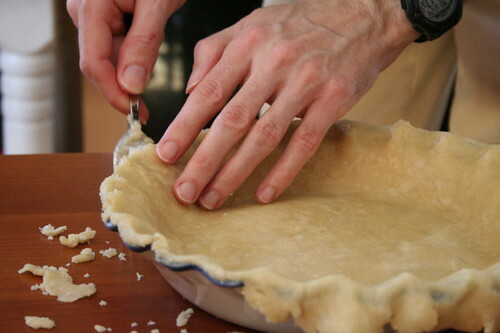 When the top is crusting over and cracks, and a toothpick inserted into the center comes out gooey, but the surface is firm, the pie is ready. 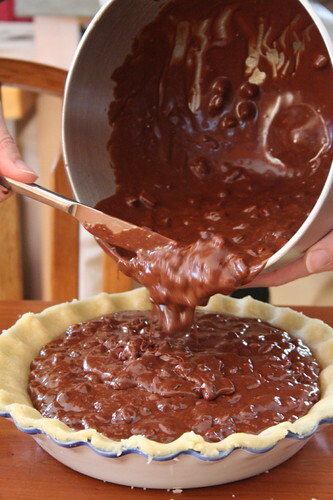 The pie will set when it cools off. 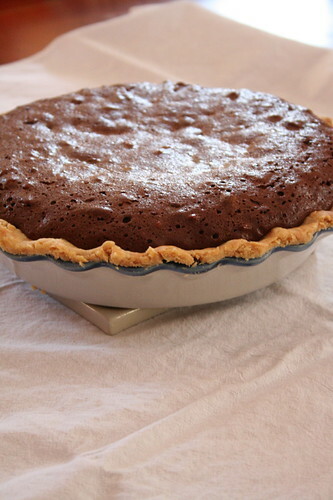 Be sure to let pie cool off completely to room temperature before serving, or it will be too gooey to cut. Thank you for all of the sweet comments about my DROPS cardigan! In spite of a few quibbles with it, I am quite pleased with the outcome! And the yarn! Oh, the yarn. You all need some Queensland Kathmandu DK Tweed. Did I mention that it’s the same as Jo Sharp Silkroad DK Tweed? I suspected as much but a trip to my LYS confirmed it: the Jo Sharp yarn color numbers are exactly the same as the Queensland color numbers. Coincidence? I doubt it. This Bea Ellis hat and Lamb’s Pride scarf I made Aaron are the only things I’ve knit him that see reliable wear. To be fair, they’re the only things I’ve knit him that are very nice. You should see this sweater I made him pre-blog – it’s positively hideous. In any case, his gloves aren’t very warm and I thought I would make him a pair of thrummed mittens for nighttime dog walking. He’s long maintained that mittens are far inferior to gloves in terms of dexterity but then again, dog walking requires little of that. And certainly, there will be very little range of motion in these babies. I got the idea from Jenna and then Pam had to go and cast on for some and, well, here you go. In a rash of vacation startitis, I also cast on a few more projects. At least the rest of you can blame holiday knitting. I swore off that this year so I have no excuse. 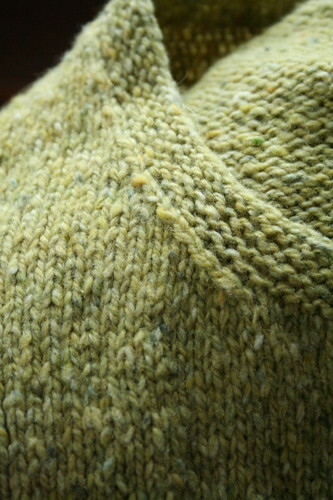 Below, a top-down raglan in Beaverslide wool and the second Drunken Bee to match the sock Stella so ably knit for me. I keep casting on for more because none of these are (yet) purse projects. The sweater was ideal until it grew too big to fit in the purse. 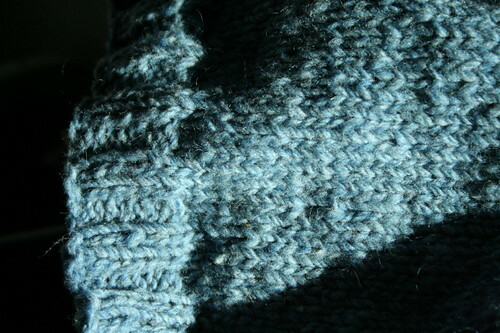 The sock was great for the ribbing but I haven’t yet memorized the pattern and so I can’t knit and do anything else. The mitten pattern is easy to memorize and nice and portable but the thrums are decidedly not easily transportable. I’m not even going to add these to my Ravelry project list until they’re done because I don’t really want to see my WIP list go up. What denial, eh? I made many, many modifications to this sweater. As knitting patterns go, DROPS and Phildar both seem to have an unhealthy obsession with bound off decreases and sewn-on edgings. Perhaps a more experienced knitter out there could help me understand why these techniques are better than ssk/k2tog decreases and picked up stitches. This pattern calls for bound off decreases at the neckline, the sleeve cap and the armholes. The first time around, I did as I was told. If my camera lens hadn’t broken in the process, I would present you pictures of the neckline’s ugliness with those stair-stepped decreases. I reworked the neck several times before I decided to rip the stockinette parts of the sweater and redo with ssk/k2tog decreases, as you can see from my previous post. Isn’t that much cleaner? As for the neckline itself, I ended up picking up 138 stitches and knitting a garter stitch band, which is what I thought the pattern called for when I started. 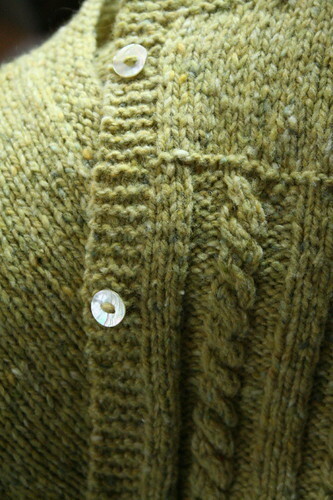 It is always so hard to see details in DROPS photos, the price, I suppose, of a free pattern. It turns out that the pattern calls for a curled reverse stockinette band. In general, I find reverse stockinette bands look a bit sloppy and I thought a garter stitch band would both look cleaner and match the garter stitch button bands. I also ripped the sleeves because they were way too wide, in spite of my gauge being dead on. Because I reduced the width from almost 15″ to 12″, I had to knit a long sleeve cap in order for the sleeve to fit in the armhole without puckering. Not to fear, good old Pythagoras and some algebra came to my rescue and the sleeve went in perfectly. 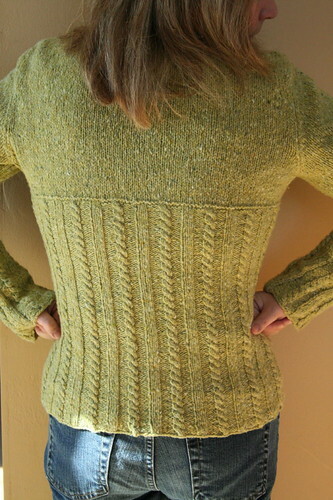 While I absolutely love this sweater (and the yarn), there are a few things that I find a bit dissatisfying. First, I knit the 37.5″ size for a 35″ chest and no matter how many times I blocked this sweater to size, the cardigan puckers at the buttons. If I were to do it again, I would simply use more buttons. I think any ribbed sweater would pucker with only four small buttons. Secondly, the first button is not placed until 4″ up. As a result, the bottom looks a bit funny when buttoned up, as you can see in the picture above. 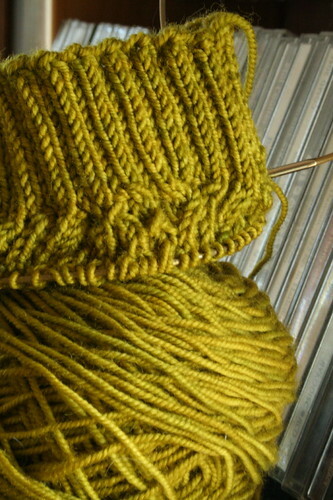 I also think I would consider making the 37.5″ size for the cabled ribbing and switch to the 33″ size for the top. I think the top is a bit too wide for me. When I put it on, I make an extra effort to pull the sleeve seams up to my actual shoulder line. They’ll stay there without a problem but I wouldn’t have to think about it if the shoulders were an inch or two narrower. You can see what I mean in this picture if you’ll forgive me for looking like such a goober. 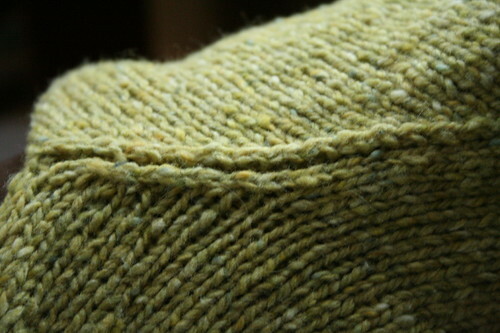 While I love the cabled ribbing, I would likely only drop down to a US 5 needle next time around. 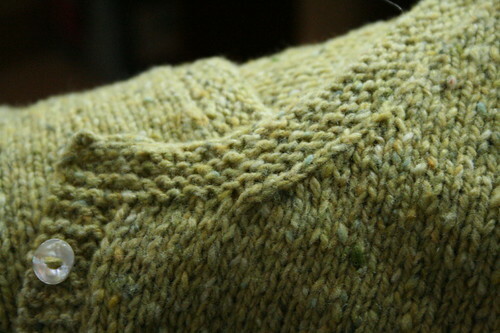 The pattern calls for the ribbing to be knit on 3s while the rest of the sweater is done on 6s. Frankly, the ribbed pattern shrinks up so much that I doubt the needle difference would be a problem. On the contrary, I imagine it would make the sweater easier to block. Unblocked and unstretched, the cardigan measured 22″ around at the waist. There’s really no question about blocking – 22″ is not meant to stretch that much when the garment is held closed with a mere four buttons. 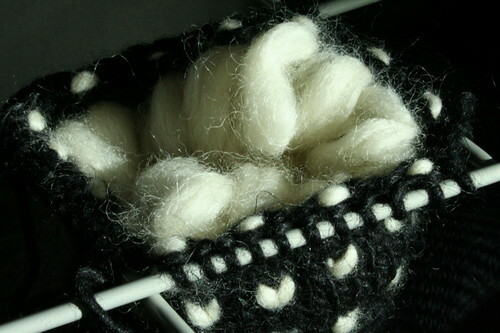 There’s another finished sweater waiting to be blogged but it’s black and you know what that’s like for pictures. Maybe when Aaron’s off from work next week I’ll get some worth saving. Blogging will resume now that a new camera lens has arrived to replace the one that broke. Here’s a preview of my newest FO. 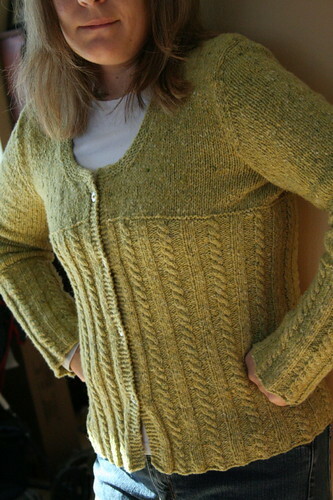 I made many modifications to the pattern so expect a more detailed blog post (and Ravelry entry) later this week.